Don’t dismiss safer-bet colleges as lower in quality or places where a student won’t be challenged. Some students and parents balk at the term “safety school” — or are even dismissive of such an option, according to Kiersten Murphy, president of Murphy College Consultants in Issaquah. But it’s important to counterbalance an application to a highly selective university with a highly realistic option where admission is likely, Murphy says — without dismissing safer-bet schools as lower in quality or a place where a student won’t be challenged. In other words, not everyone can go to Stanford — there aren’t enough seats. Just 4.3 percent of 2018 applicants to Stanford were accepted, according to The Mercury News. What is a safety school? 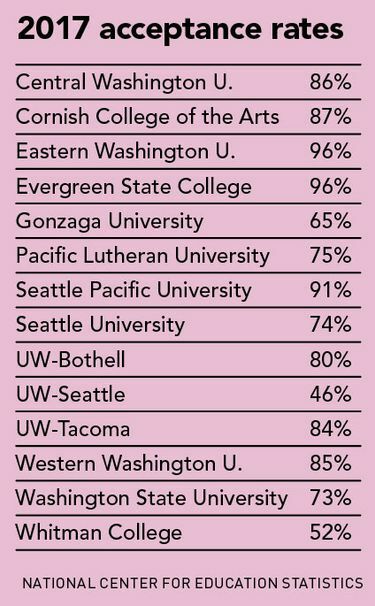 A college or university that admits more than 70 percent of applicants, and one in which the applying student falls within the mid-50 percent or higher of the school’s admitted students’ test scores and GPA, according Seattle-based G2 College consultant Catherine Gaston. “I view a ‘safety’ or ‘likely’ school as one that is not only a good match for a student, but also one in which I’m very confident a student will be admitted,” Gaston says. So a safety school for one student may not be a safety for another. “These should be colleges where the students would be happy and excited to attend,” Murphy says, with a student’s interest cemented through campus visits and meeting with admission counselors to determine great student-school fit. Admissions officers consider a student’s rigor of curriculum, essays, letters of recommendation, personal qualities or talents, and extracurricular activities. “Colleges want to build a class of interesting students who will contribute to their communities both in and out of the classroom,” Murphy says. A match is a school that admits 20–70 percent of applicants, and where the student’s GPA and test scores are within the mid-50 percent of admits. The cost of tuition is one reason more students may be accepting offers to safety schools. Because the cost of attendance should be a factor when students evaluate fit, a safety school can be “a school the student can afford to attend,” says Lauren Gaylord, also with G2 College. “I have noticed a trend over the last few admission cycles … more and more students are enrolling at safer-bet colleges,” Murphy says, with students declining invitations to highly selective, private colleges admitting fewer than 20 percent of applicants and attending an affordable state university with a higher admit rate. These options could be a better financial fit for the student’s family, Murphy points out, be it a lower-cost, in-state public university or a university where receiving a merit scholarship is probable. “However, students should also recognize that just because the school is a more favorable admit doesn’t guarantee merit money, so do your homework, and understand the college’s policies,” Murphy says. A “financial safety” pick contributes to the truly well-rounded college list, Murphy notes. “Students seem to be more aware of the financial burden for their parents, and want to attend a college that is affordable,” she says.